For the longest time, I’ve wanted a nice yellow columbine in my garden. I saw one at a garden center a few weeks ago and almost bought it, but then I reminded myself that with all the changes I’ve planned for my garden this year, this is not the best time to be buying new plants. So I passed it up. I know! One of the rules of the gardening geekdom is never pass up a plant that you really, really love for silly reasons like you have no place to put it, or you have too many plants (does not compute) or you are “re-doing your gardens so just wait until that is done before you buy more plants”. Please don’t kick me out of the society of gardeners just yet. 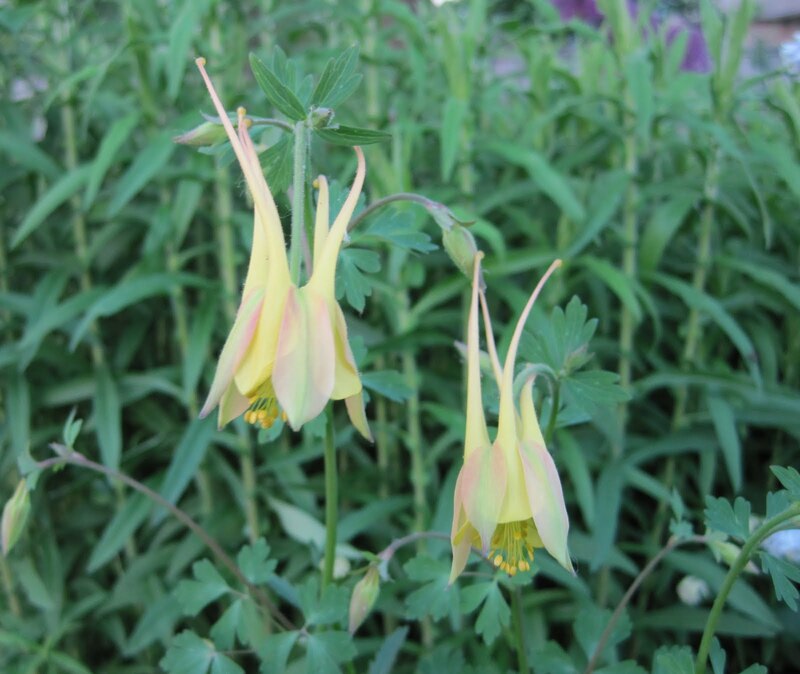 For several days, I was still thinking off and on about that lovely yellow columbine that I passed up when what do you know – I discovered a yellow columbine in my very own garden. Did the garden fairies plant it? Or did an absent-minded gardener purchase it last year, plant it, and then forget about it? Let’s go with “garden fairies” as the answer. I did find a tag for it, which was nice of the garden fairies to leave for me. It appears to be Aquilegia ‘McKana Hybrids’, which is not as precise a name as I’d like to see, but it is still a nice yellow columbine with a hint of pink striping and for now, satisfies my desire to have a yellow columbine. It also makes me feel just a tiny bit less remorseful for passing up the other one. But it does make me wonder what else is out in the garden that I don't know about? Isn't it nice of the fairies to surprise you like that! Aren't surprises like that just lovely! Happens to me too! Columbines are such great volunteers. They turn up in the most surprising places. I think the garden fairies have been very active in my garden, too, because I keep finding plants that I don't remember planting:) You have quite a collection of columbines--so pretty! The few I have are still babies; I wonder why they're so late? One of the many delights of touring ones own garden is to find what the Garden Fairies have done. The fairies know that the McKana Giants have those nice long spurs. I planted a whole packet, oh, too many years ago, and the only one that popped up was a yellow one! But it lasted and lasted and lasted, till we moved houses. I tried to take it with us, but it pined for home. Perhaps it made its way to your garden? I planted columbine from seed last year, and planted the young plants out in several of the flower beds. They are just blooming like crazy right now, and I couldn't help but do a post on my blog about them a couple days ago. Columbines are notorious for "changing their spots." I've never planted a white one, yet one that was previously pink has bloomed white the last two years. They will readily cross-pollinate, so if you want them to stay "pure," it would be better to keep each variety some distance away from each other. Of course, sometimes the result is quite lovely! How nice the garden fairies were to leave you a tag. Maybe you could send them off to the Havens and they could convince the blue jays to give back mine. . . Pretty lovely columbine. sounds like your new garden is coming into shape nicely, too.